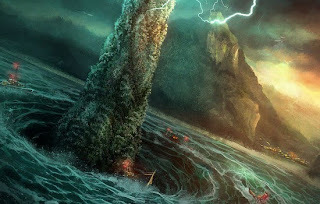 Charybdis | Learn about Greek Mythology,Greek gods,Greek mythology stories! The Charybdis or Charyvdis or whirlpool or sea vortex,according to the dictionary Liddel-Scott, name of dubious etymology, is a female monster of Greek mythology. Considered daughter of Poseidon and Gaia. She lived on the Asian shore of the Strait of Bosporus (on the European shore lived another monster, Scylla) and was sipping sea water engulfing with passing ships and sailors. Later mythographers transferred the residence of the two monsters over the Strait of Messina between Italy and Sicily. Both Charybdis and Scylla involved in the myths of Odysseus and the Argonauts, who went through those straits having few losses.